Wings of regal moth Citheronia regalis. From Comstock (fig. 345) . 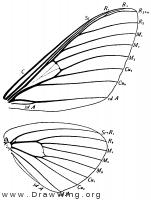 Wings of Anisota virginiensis. From Comstock (fig. 339) .